This week we have a review of Be Our Ghost By Kate Kingsbury, another perfect book for your Halloween reading! 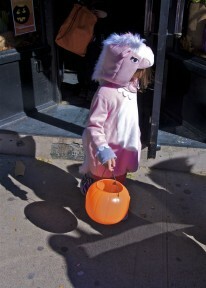 We also have a fun Halloween guest post by Kate. Details at the end of this post on how to enter to win a copy of Be Our Ghost, a link to purchase it from Amazon, and an indie bookstore where a portion of the sale goes to help support KRL. Melanie West lives with her grandmother Liza and a resident ghost they call Orville. They’re not exactly sure who the laughing voice belongs to, but a ghost in an inn is a good marketing ploy so why not use him. Liza is sweet on Doug who owns the hardware store that has a little restaurant in it. Where else would you go for lunch? He seems to be sweet on her, too, but both are stalled as to what the next step might be. Melanie is kind of, sort of, dating, maybe. Ben, a local cop, is a catch, but Melanie has a secret she’s sure will keep them apart. Also in the house is Max, a sheepdog/wolfhound mix, and the multi-tattooed Cindi, their employee who invariably runs late for her shift. When a real estate developer shows up in town, determined to change the face of everything by building a tacky amusement park arcade set right in the middle of town, he has everyone up in arms to stop him. Finding his dead body is a shock but not nearly as much as finding out Doug is the prime suspect. It seems the pair had history from years ago and that’s enough for the police to bring Doug in for questioning more than once. Liza is positive he’s innocent and determined to prove it with Melanie’s help. On a more personal note, Melanie is hunting for her mother and is in contact with a woman named Vivian who has a clue to her whereabouts. After so many years, it’s a challenge. Her mom left Melanie with Liza and went to England, but there’s no record of her arrival or what happened next. Melanie and Liza are not ones to take unnecessary risks although risk seems to find them. Their relationship is a good one, warm and close, without getting in each other’s way. Readers will want to know more about Orville, the ghost, and Max the dog. Dogs always add to a story! Relationships with Doug and Ben spice up Liza and Melanie’s lives but never without problems to overcome. This is the third in the modern day series. Liza shares her recipe for Incredible Blueberry French Toast at the back of the book. A prolific writer, Kingsbury also pens the more historical but equally enjoyable Edwardian Pennyfoot Hotel mysteries (18), the Pennyfoot Hotel Christmas Special books (3), and nine Manor House mysteries. I grew up in London during the nineteen-forties, and the closest thing I ever came to Halloween was watching an American movie. Not that we didn’t have nights when we went around knocking on people’s doors. November Fifth is Guy Fawkes night, when the U.K. commemorates the gunpowder plot to blow up the Houses of Parliament. For a week or so before the Fifth, I would join a group of kids to knock on doors and ask for “A penny for the guy!” The money was used to buy fireworks, which were let off around a bonfire on the night of the Fifth. We’d burn a “guy” made from old clothes stuffed with newspapers on the bonfire and dance around it making a lot of noise. All rather primitive stuff. Then there was the Christmas caroling, when we’d knock on doors and sing for our neighbors. But no Halloween. That didn’t become popular until after I left the U.K. and moved to the U.S.
My first experience with Halloween was a bit overwhelming. We had been in the country just over a month, and my husband and I had been warned that we’d be visited by a ton of kids, all asking for candy, and if we didn’t oblige, we would suffer the consequences. It sounded a little threatening, but hey, anything to do with candy and I’m there. That night my husband had to work, so there I was, all alone in our apartment, with nothing but a bowl of candy to protect me from all those trick-or-treaters. At the first ring of the doorbell, I nearly jumped out of my skin. I opened the door to be confronted by half a dozen little kids, all dressed in colorful costumes. I wasn’t expecting the outfits, and stood there admiring each one of them until one of the kids yelled “Trick or Treat!” I hastily shoved the bowl at them and watched half of its contents disappear into their bags. Realizing my mistake, I refilled the bowl and waited for the next group. This time I handed out the candy and they all went off, smiling and satisfied. This, I told myself, wasn’t so bad. Actually, it was rather fun. The doorbell rang again, and once more I opened the door. This time the group on my doorstep was older, and no costumes. I started to hand out the candy, but one of the boys took the bowl out of my hands and emptied into their sacks. Then they pushed past me, and walked into my apartment. Terrified, I watched them saunter into the kitchen and open the fridge door. Having apparently seen nothing to their liking, they left the kitchen, and without a word, filed out the door again into the street. I slammed the door shut behind them, securely locked it, and turned off all the lights. There I sat, in the darkness, until my husband returned home. Needless to say, that experience soured me on Halloween. Until my son was born. I couldn’t deprive him of such an exciting childhood experience, so the first year he was old enough, I dressed him up and took him trick or treating. I had never seen him have so much fun. After a while, I realized I was having fun with him. Especially when he brought home all that candy, and I got to share it with him. Like I said, where there’s candy, I’m there. So now Halloween has happy memories for me. I still hand out candy to kids, and admire their costumes. After all, that night is for the kid in all of us, right? If you’re a fan of Halloween and into ghosts, goblins, and things that go bump in the night, you might enjoy Be Our Ghost. Orville is not your ordinary ghost. He has a warped sense of humor, and loves to play tricks, which sometimes turn out to be important clues in a murder investigation. Now that’s a pretty cool trick! 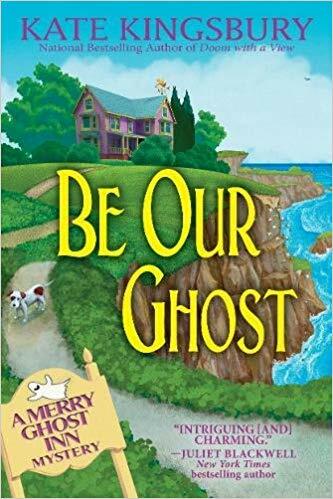 To enter to win a copy of Be Our Ghost, simply email KRL at krlcontests@gmail[dot]com by replacing the [dot] with a period, and with the subject line “be our ghsot,” or comment on this article. A winner will be chosen October 27, 2018. U.S. residents only. If entering via email please include your mailing address (so if you win we can get the book sent right out to you), and if via comment please include your email address. You can read our privacy statement here if you like. Check out other mystery articles, reviews, book giveaways & mystery short stories in our mystery section. And join our mystery Facebook group to keep up with everything mystery we post, and have a chance at some extra giveaways. Be sure to check out our new mystery podcast too with mystery short stories, and first chapters-October’s podcasts feature Cleo Coyle’s first Haunted Bookshop Mystery, and a creepy mystery short story by Merrilee Robson. 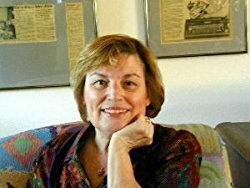 National best-seller, Kate Kingsbury, grew up in London, England, and at a very early age began telling stories to her school friends while huddling in bomb shelters during the Blitz of WW II. Since then she’s written over sixty romance and mystery novels. She now lives in Oregon with her husband, Bill. Besides her Merry Ghost Inn series, she also writes historical mysteries set in Edwardian England. Fans of her Pennyfoot Hotel Mysteries will be happy to know another Christmas edition of the series will be released in the fall of 2019! You can find Kate’s website at www.katekingsbury.net. Disclosure: This post contains links to an affiliate program, for which we receive a few cents if you make purchases using those links. KRL also receives free copies of most of the books that it reviews, that are provided in exchange for an honest review of the book. I enjoy resident ghosts stories, this one sounds like fun reading! Thanks for all the info! As a great-grandmother who raised teen aged kids and a grandchild, and enjoyed & participated in Halloween myself … I’d have had a thing or three to SAY to those teenagers (bad actors like those give Halloween a bad rep…) I was happy to see dressed-up teens at my door, they were having fun & doing no harm. How awful that those teens showed up on your first Halloween! Thank you for your review … I read & enjoyed the first book. I’m glad you now enjoy Halloween. Sorry your 1st experience was so traumatic. Thanks for a chance to win your book. Please enter my name in the book giveaway. I think I’d really enjoy reading it. A recent post from Nora-Adrienne Deret: November seems to be early! What creepy teens! I wouldn’t ever open my door on Halloween again after that! I would love to start reading this series; sounds like fun! This is a fun series. I’m especially looking forward to that blueberry french toast recipe. “Be Our Ghost” sounds like my kind of read. Sounds like a great read. This sounds delightful! Thanks for the opportunity!